As author Stephen Dobyns observed in Eating Naked: Stories, “If it weren’t for the Chicagos and Detroits and Toledos, the terrible things would spread out across the whole country and make trouble for everybody else. Such places were collectors of badness in the way hospitals were collectors of the sick and damaged.” Detroit residents might object to this characterization in principle, but it is clear that Detroit has seen more than its share of hard times, yet Detroit has at times seemed to be uniquely American in its success. “If ever a city stood as a symbol of the dynamic U.S. economy, it was Detroit. It was not pretty. It was, in fact, a combination of the grey and the garish: its downtown area was a warren of dingy, twisting streets; the used-car lots along Livernois Avenue raised an aurora of neon. But Detroit cared less about how it looked than about what it did—and it did plenty” (Time Magazine, 1961, “Decline in Detroit”). If Detroit will rise again or become a ghost town remains to be seen, regardless of whether its demise is due to poor neighborhood identification, bad housing stock, insufficient public infrastructure, a weak downtown, freeway expansion, lack of public transit, the state of local government, the huge amount of industrial land within the city, or badly executed annexation policies that absorbed areas to fulfill temporary housing needs, but it is clear that problems haunt Detroit. The impending doom of Detroit has an anthropomorphic form called Le Nain Rouge (French, “Red Dwarf”, sometimes also known as “The Demon of the Strait”), a harbinger of doom straight out of the mythology of Normandy, France. When horrible things happen in Detroit, they are often presaged by sightings of this diminutive, shambling, red-faced creature with fur boots, blazing red eyes, bony knuckles, and rotten, protuberant teeth that caws like a crow. Ontologically, the attribution of Detroit’s many historical disasters and failures to an anthropomorphic entity is not a phenomenological judgment per se, as this is not an analytic requirement of the concept. “Anthropomorphism cannot be reduced to observer independent properties of objects, systems, or creatures. Anthropomorphism is an experience, an understanding of complex – not necessarily human – patterns of behavior in the world. Anthropomorphism is a way of simplifying and hereby making sense of the environment by projecting a host of expectations about human life onto aspects of that environment. ‘Anthropomorphizing’ reality is a stance, describing and explaining intricate domains of reality in terms of abstract frameworks of folk-psychology and human life” (Persson, Laaksolahti, & Lonnqvist, 2000, p.1). 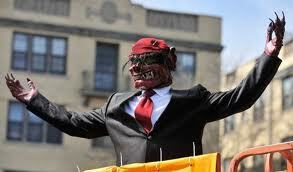 The Nain Rouge is the embodiment of the sad history of Detroit, and whether he is the doom of Detroit incarnate, the ascription of intelligent agency to the vagaries of war, culture clash, and economics, the manifestation of primitive fear of the unknown and uncontrollable, or a species of supernatural creature is largely unimportant. The fact that the Nain Rouge is so commonly sighted before, or whose appearance is subsequently associated with, disaster befalling Detroit suggests he has, if nothing else, a sort of conceptual, if not natural presence worth looking at. Clearly, the Nain Rouge fall into the problematic category of creatures that anthropologists call the Trickster, “the most paradoxical of all characters in Western narratives – at least as far as the western mind is concerned – for he combines the attributes of many other types that we tend to distinguish clearly. At various times he is clown, fool, jokester, initiate, culture hero, even ogre…He is the central character for what we usually consider many different types of folk narratives” (Doty and Hynes, 1993, p.17). Interestingly, the early mythological origins of the Nain Rouge do not equate it with premonitions of doom, rather a more typical Celtic fairy capable of remarkable generosity or rabid unpleasantness, depending on how it feels it’s been treated. The concept of the Nain Rouge, if not the fellow himself, was no doubt imported to North America through the French colonization of Canada, particularly Quebec, and interestingly, filters into the Detroit area immediately upon its founding as Fort Pontchartrain du Détroit by Antoine de la Mothe Cadillac (born Antoine Laumet) in 1701 as a military outpost, mission, and trading port on the Detroit River. Antoine de la Mothe Cadillac, was said to have been attacked by the Nain Rouge in 1701, and subsequently lost his fortune. The Nain Rouge is said to have appeared at the Battle of Bloody Run in 1763, where Ottawa and allied Indians (led by Chief Pontiac) killed 58 British soldiers. A loose confederation of Native American tribes who resented British policies in the Great Lakes region following the French and Indian War (1754-1763) attacked British forts and settlements in the area, culminating in the siege of Fort Detroit. On July 31, 1763, 250 British soldiers attempted to break the siege by attacking Pontiac’s nearby encampment at Parent’s Creek. The British were defeated in an ambush by four hundred Ottawa, Ojibwa, Potawatomi, and Huron warriors who had been alerted to the attack by French settlers. The siege continued until October 1763 when Pontiac abandoned the siege and moved on. The day before the Battle of Bloody Run, Capt. James Dalyell, the commander of the force that attempted the raid on Pontiac’s camp, was reportedly stalked by the Nain Rouge along the banks of the Detroit River. Dalyell himself was killed in the battle, and his head paraded in front of the fort on a pike. Multiple sightings of the Nain Rouge were reported before the 1805 fire that burned down most of Detroit. Detroit of the time had a population of about 600 and lacked a professional fire department. Surprisingly, nobody died in the fire. All 200 structures in the city, except a stone warehouse burned to the ground. The residents remained, and a new street plan was laid out modeled after Washington D.C. The Latin motto on the flag of Detroit dates from this era and reads, “It will rise from the ashes”. Just before General and first governor of the Michigan Territory William Hull’s surrender of Detroit in the War of 1812, he reported seeing the Nain Rouge lurking in the fog. It is rumored that Hull surrendered Detroit to the British without firing a shot after seeing its menacing red eyes. Hull, although a distinguished officer in the American Revolution, is also the only American officer to ever be sentenced to death for military incompetence as a result (the sentence was commuted at the request of President James Madison). Despite painstaking research, the original source for this claim could not be found, and examinations of the records of Hull’s court martial do not contain any reference to the Nain Rouge. The day preceding the 12th Street Riot in 1967, the Nain Rouge was seen. The 12th Street Riot was a five day race-related civil disturbance resulting in 43 deaths and the burning of two thousand buildings. “The Red Dwarf dashed down 12th street, doing back flips and cartwheels on the night of the police raid that sparked the race riots of 1967” (Schlosser, 2010, p1.). Before an enormously destructive March 1976 snowstorm, utility workers reported chasing the Nain Rouge and in 1996, the Nain Rouge was spotted breaking into a car. The Nain Rouge clearly maintains a presence in Motor City, although it would seem that his pranks and devilish behavior have begun to border on the mundane. In 2010, Detroit residents wisely resurrected an old annual tradition, dating back to the founding of the city called “La Marche du Nain Rouge”, where during the Vernal Equinox, revelers headed by twelve long time Detroit residents called La Bande du Nains, symbolically drive Le Nain Rouge from Detroit. This is obviously a modern urban version of Pascal’s Wager in that there is more to be gained from betting on the existence of Le Nain Rouge than in disbelief. And should you chance upon a red gnome that caws like a crow on the dark streets of Detroit, treat him with respect. Maybe we can avert another disaster. DOTY, W.G, HYNES, W.J. (1993). Historical Overview of Theoretical Issues: The Problem of the Trickster. In Mythical Trickster Figures: Contours, Contexts and Criticisms. William J. Hynes and William G. Doty, eds. Pp 13-32. Tuscaloosa, AL: The University of Alabama Press. HAMLIN, M. (1883). Legends of Le Detroit. Detroit, MI: Thorndike Nourse, 1883. KEIGHTLY, T. Fairy Mythology. London, UK: George Bell & Sons. MACLAREN, A. (1857). The Fairy Family: A Series of Ballads and metrical Tales Illustrating the Fairy Mythology of Europe. London, UK: Macmillan & Company. ROGERS, R., HOUGH, F.B., BRADSTREET, J. (1860). Diary of the siege of Detroit in the war with Pontiac: also a narrative of the principal events of the siege. Albany, NY: J. Munsell. SCHLOSSER, S.E. Red Dwarf of Detroit. Retrieved from http://americanfolklore.net/folklore/2010/07/the_red_dwarf_of_detroit.html on November 11,2012. PERSSON, P., LAAKSOLAHTI, J., LONNQVIST, P. (2000). Anthropomorphism – a Multi-Layered Phenomenon. AAAI Technical Report FS-00-04.